Howdy esteemed programmers! It’s Andy Gesner and the HIP Video crew, here to bring you a genre bending new clip from the modern collision of four-part harmonies and Prince-like oddity, delivered to your eye sockets from an artist with a grand vision – B. Slade™ (formerly known as Tonéx). The “Start.” video will send your viewers spiraling into a whole new dimension of weird, anchored to an unforgettable pop center. B. Slade™, is what we like to call a super-musician. He is an American singer, songwriter, actor, multi-instrumentalist, rapper, dancer, and producer just to name a few. B. Slade™ has already put out several mixtapes and albums since his inception, including the widely downloaded Stereotype album, which deals with the duality of human nature. He also received a Grammy nomination in 2009 for Best Urban/Soul Alternative Performance. That year, he also presented awards at the Grammy pre-show, including the first two awards given to Lady Gaga. Now the eclectic mastermind of a genre not usually filled with too many people willing to stray from a tried-and-true formula returns to please his devoted fanbase with the brand new album, Diesel, captivating the blogosphere and press. 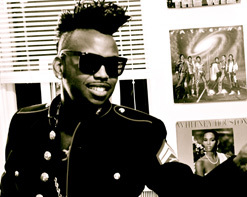 For example, B. Slade™ has been featured in a massive New Yorker feature and interview last year. His record has been highlighted on blogs like FAB,Crunktastical, Groove Loves Melody, Tim Dillinger, Essence, Page21 and many more. B.Slade also recently performed “You Make Me Feel (Mighty Real)” as a tribute to the late disco singer Sylvester at the 7th Annual OutMusic Awards. Just as a word of mention, B. Slade™ is also very well known as his former moniker Tonéx (pronounced Toe-Nay), an ingeniously talented, flamboyant provocateur and Grammy and Stellar Award winning household staple within the gospel community. “Start.” is the rebirth of an artist who has made a successful career and then gave it up to reinvent himself once again. The song combines eclecticisms of Prince with the four part harmonies of Queen in an R&B and pop setting to deliver a hopeful message about starting over again. This sort of unique combination and fearlessness is what has set B. Slade™ apart from his contemporaries for years, allowing his vocals to shine in a new setting of provocative and intimate sounds rather than sticking to the vanilla of tried and true. B. Slade™’s enthusiasm for the avant-garde allows him to unite catchy and classic harmonies with the sonic dimension of the unfamiliar. The video follows B. Slade™ as he dances across the city streets while his philosophical messages are displayed on the screen. The clip is also spliced with shots of our hero laying down on the pavement, as if he is letting his old self die to give way to a new invigorated persona. This strange, yet welcoming clip also embraces the color orange, giving it a perfect shade for a video hitting the screens this Fall season. It is our greatest honor to be representing an artist that has succeeded by constantly breaking the mold. We are sure that his newly reinvented persona will not only bring back the legions of fans from his former releases, but gather numerous new followers as well. “Start.” is the leading single from B. Slade™’s new album Diesel, so please don’t hesitate to be in touch to get your hands on a copy of it for contests and giveaways! If you need more info, call Andy Gesner at 732-613-1779 or e-mail us at hipvideo@aol.com. You can also visit www.BSladeNow.com to find out more about B. Slade™.